It's been an uphill struggle all season for Derbyshire - and the final round of County Championship fixtures is no different! A win against Warwickshire is the Falcons only chance of avoiding relegation in a season which really only began mid-way through it. Derbyshire struggled at times with the pressure of session by session cricket in the top division and some brutal batting and bowling by opponents really cost them at the start of the season. However, the side, led by skipper Wayne Madsen, found a way of winning towards the end of the season. Vital wins over Sussex, Middlesex and Somerset having given the Falcons hope going into this final match. Derbyshire sit 15 points away from local rivals Nottinghamshire, whilst Somerset are 16 points ahead. Karl Krikken's side know only a win would give them an opportunity to stay in Division One. As Nottinghamshire face Somerset, a draw would be the best result for either of those sides to stay up, if the sides are level on points, Derbyshire with a win over Warwickshire, would stay up having won more matches than either of those two sides, it's vital that Derbyshire get close to the 24 points available. 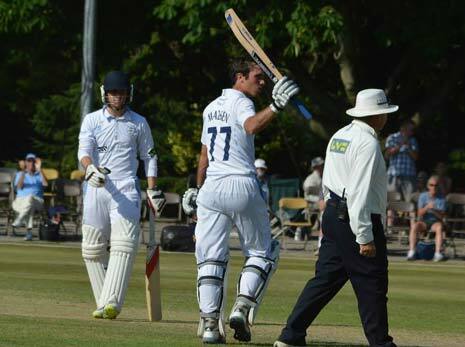 Speaking to Derbyshire's CCC Website (www.derbyshireccc.com) skipper Madsen (pictured above after reaching his century during the Chesterfield Festival of Cricket), is excited by the prospect of last day survival, "We have to win! It's an exciting prospect for all the guys and they are buzzing for it." Derbyshire have the weather to contend with at this late finish to the season, the forcecast is set to remain changeable with the toss perhaps proving to be vital. Derbyshire have named a 15 man squad with Peter Burgoyne, Mark Turner, Wes Durston and Chesney Hughes added from the last match versus Durham. This means there is a place for Richard Johnson, who injured a hand in the defeat to championship winners Durham, but has recovered in time. Wayne Madsen, Ben Slater, Paul Borrington, Shivnarine Chanderpaul, Richard Johnson, Alex Hughes, Tom Poynton, David Wainwright, Tony Palladino, Tim Groenewald, Mark Footitt, Peter Burgoyne, Mark Turner, Wes Durston, Chesney Hughes. Start time at the County Ground is 10.30am, Tuesday 24th September.